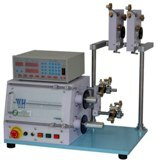 Two - spindle semi-automatic benchtop coil winding machine with digital controller for winding inductors, gas ignition coils, solenoids and sensor coils with heavy wire WH-752. Spindle drive - High torque brushless DC induction motor producing a max torque 157 Ncm. Roller type wire guide head and separate wire tensioning units for each spindle. Each wire guide head is fully adjustable so that winding may be done simultaneously on both spindles. Includes 2 x roller wire guides and 2 x wire tension units, with comprehensive manual. 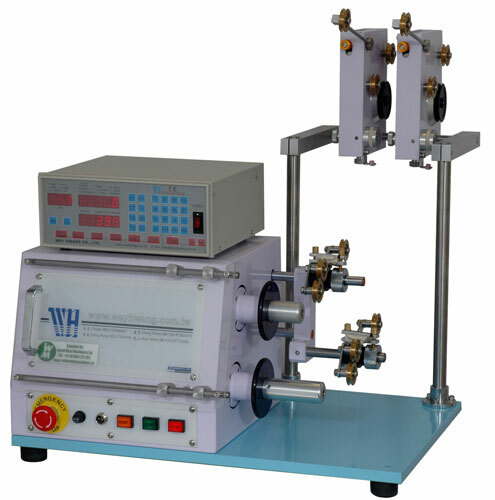 The WH-752 is a compact benchtop coil winding machine with digital control for semi-automatic operation, ideal for winding inductors that require a larger wire size. The machine is equipped with a roller type wire feeder system and wire tension control unit for each spindle, each being independently adjustable to enable winding to be carried out on the two spindles in parallel.